It’s that time of the year again where it’s cool in the mornings then warming up mid-day and then getting cool again in the evening. This is the perfect time of the year to keep your favorite scarves conveniently close. 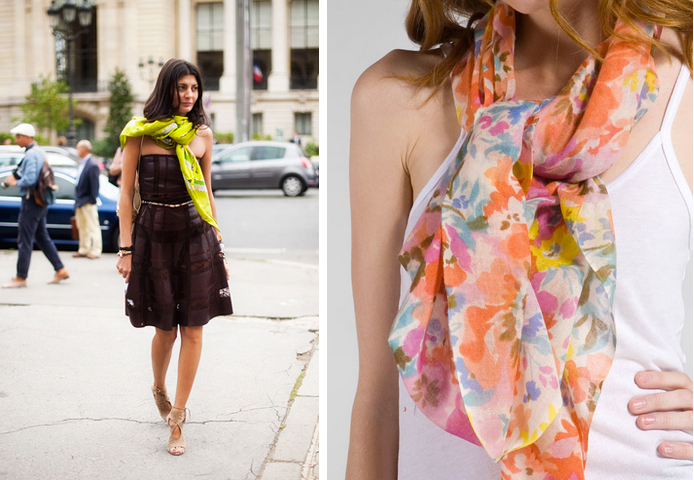 Light and gauzy scarves are the must have during this season. The mornings start out crisp (scarf on)…the afternoons are full of warmth (scarf placed in or tied to handbag)…and then the evening chill sets in (scarf back on). Scarves are also perfect for those who are easily chilled when entering a restaurant or store. There are so many ways to tie or wrap a scarf. Are you ready to add this accessory to your ensemble? Now I know that adding a scarf here and there can feel a little tricky if you haven’t accessorized with them before. In fact, adding anything “new” to your daily uniform can feel a little out-of-the-box. But I promise it’s a fun shift and you’ll be happy you shook things up a bit. If you’re still feeling a bit shy about the whole idea, check out Pinterest or even youtube videos on the many ways to show-off your scarf. You really just need one to get started–and then wear it like crazy! We are sure that you will not stay with having JUST one!